Venezuela's opposition leader Juan Guaidó has called on his supporters to take to the streets in protest at nationwide power cuts. But the opposition argues that two decades of underinvestment and corruption by Venezuela's socialist government as the cause. 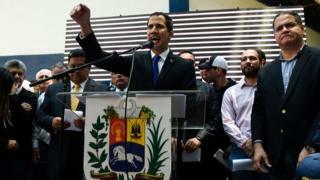 "The time has come to agitate in every state, in every community, to get water back, get electricity back, get gas back," Mr Guaidó told a rally in the capital Caracas. "The light has gone out, we cannot remain as passive actors," he said. Mr Guaidó said that preparations were being made for a mass mobilisation - dubbed Operation Freedom - to try to force Mr Maduro to step down. The event is intended to culminate in a huge march through Caracas. 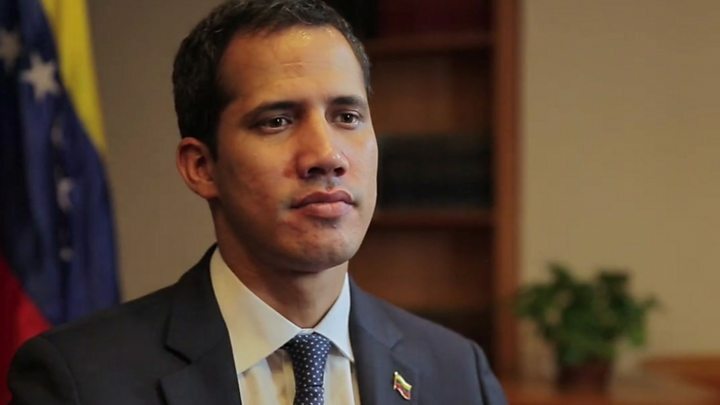 Mr Guaidó, the head of the opposition-controlled National Assembly, declared himself interim leader on 23 January, saying Mr Maduro's re-election last May was illegitimate. Power returned to about half the country's 24 states late on Tuesday, only to fail again on Wednesday morning. Earlier this month, a days-long nationwide power cut sparked looting and desperation across the country. "I think this is going to be worse than the first blackout," said Julio Barrios, an accountant in Caracas. "A lot of people want to work but there's no transportation and if there's nobody working the country will be paralysed," Mr Barrios added. "Food stocks are starting to rot. There's no water. The transport virtually doesn't work. There's no means of communication," he said. The government has said it is battling to restore supplies and blamed the cuts on opposition "sabotage" and "terrorism", without presenting any evidence for those claims. Mr Trump was speaking after a meeting in Washington with Fabiana Rosales, Mr Guaidó's wife. "Russia has to get out," Mr Trump said, adding that "all options" were open to ensure it removed its soldiers. A confidential report sent to both sides apportioned no blame for Venezuela's crisis but said the lack of aid in the country was significantly worsening the already dire crisis. Shortly after Mr Guaidó declared himself interim leader, his assets were frozen and the nation's Supreme Court, dominated by government loyalists, imposed a travel ban on him.